The first mobile card collecting game that's been able to keep my attention for more than a few days just got its first big raid event. 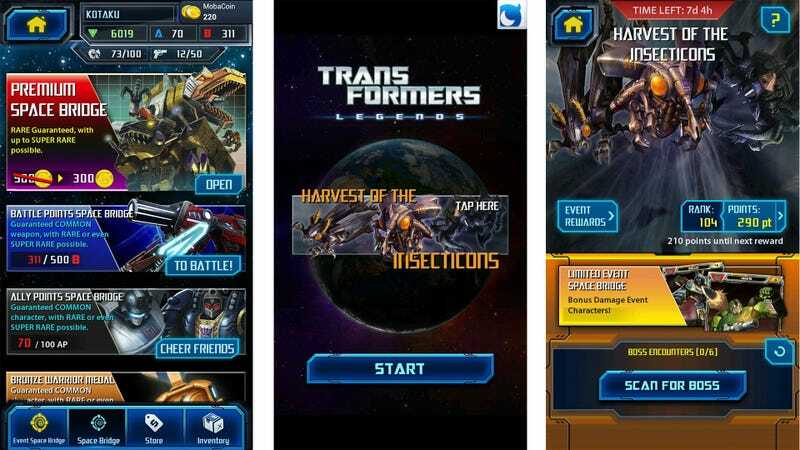 The Insecticons are running rampant in Transformers Legends on Android, and it's up to me to stop them. You can help, I guess. For those unfamiliar with the genre, these collectible card games—games in which there is little actual gameplay but plentiful opportunities to spend real-world money for virtual pieces of art with stats written on the back—regularly feature special themed events in which players can battle special enemies in order to win rare, event-only cards. It's playing on the games' addictive nature, whipping players into a frenzy of playing and paying. I've only spent $12 so far, so it's okay. Anything over that is excessive. Check back with me next week to see that number go up. The Harvest of the Insecticons event sees players taking on powerful versions of Shrapnel, Bombshell and Kickback. Taking down these bosses earns points and rewards. At the end of the seven-day event, players with the most points will receive special rare event rewards. The top tier is for players ranked from 1-100. I am currently ranked 75. Obviously I have a lot of work to do. I'd say go to Google Play to grab a copy of the Android game and join in the fun, but I'm not sure I want you all in the competition. Tell you what, you can play as long as you don't try too hard. Deal?